Following on from the results below, Pug1off re-tested the 4903106 profile on another car just to check the results. This time the engine already had a 'Piper' Inlet only camshaft and made 178bhp on RS Tuning's rolling road. After the initial test the cams were replaced with a pair of 4903106 Catcams and remapped to suit. 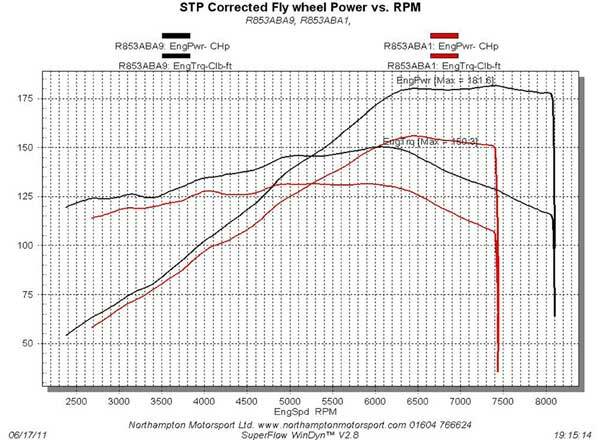 The final results are 193bhp with gains from 2000rpm over the previous setup! The owner reports this has transformed the way the car drives. Rallye models have acquired something of a cult status as great all round fast road and trackday hot hatches. produce exceptional power gains, in this case 26 bhp. increase and 10-12 lb.ft extra at 4500 rpm, making this an ideal fast road upgrade. During testing the peak power increased to 181 bhp at 7500 rpm, with over 175 bhp available from 6100 – 8000 rpm. 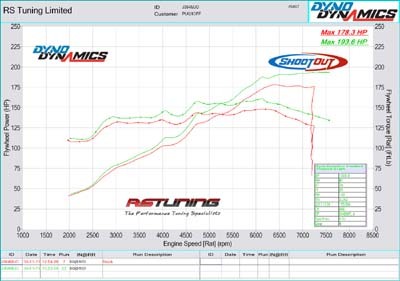 As a result of the Cat Cams / Pug1off ECU remap package, peak torque increased to 150 lb.ft on the high mileage test car. Peugeot 306 GTi-6 and Rallye are available now, priced at £486.00 including VAT.